With sport even then being a primary driver of innovation, the competitive bikes were streamlined as much as possible to reduce drag and do away with unnecessary components, including brakes. With modern cycling being such a popular televised sport around the world, how, then, do you enhance coverage of professional cycling events from angles other than traditional camera placements at trackside, on rails or overhead? One of our clients, UK-based Broadcast RF, was charged with just such a challenge by The Union Cycliste Internationale (UCI) on behalf of its host broadcaster, HBS, to come up with a new way to enhance multi-platform overage of the 2015 UCI Track Cycling World Championships at the National Velodrome in Saint-Quentin-en-Yvelines, near Paris. Their idea was to mount a camera and wireless transmission system on selected competition bikes, situated on saddle tubes just under the seat mount. 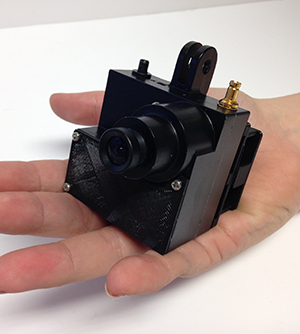 Broadcast RF therefore designed a solution and asked VideoSys to build it, incorporating Videosys's camera. A fabulous idea, but with only three weeks to the start of the competition, we had a race of our own to run. Fortunately, challenges like this are what we do, and the task set was one we were happy to accept. Designing, engineering and producing unique and innovative wireless transmission systems is our speciality. We've devised systems to capture never-before-seen angels for horse racing, motor racing, rowing and many other sports applications, so why not cycling? For components we used the Videosys proprietary miniature camera coupled with Cobham Broadcast's Nano HD transmitter and a battery pack, all linked to an external Cobham receiver, which together comprised Broadcast RF's "VeloVue HD" system. 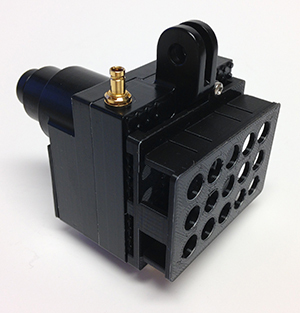 By designing our own camera from the circuit board up we were able to integrate all components of the system into one housing, saving a huge percentage of weight. Size and weight were obviously important considerations. Weight for obvious reasons, but although size usually correlates with weight, it wasn't necessarily so in this case. Cyclists tend to have large, powerful thighs, so we needed a system that was narrow enough to be unobtrusive and chaff-free as well as able to dissipate heat and remain stable when encountering the vibrations associated with race conditions. Using lightweight aluminium alloys and our 3D milling machine, we engineered and assembled wireless systems for four bikes. Following a few tweaks and alterations the system we delivered weighed only a little more than an iPhone 6, and under the maximum 200-gram weight permitted in our brief, with headroom for a bracket to affix each unit to its respective racing bike. In practice, each system was unnoticeable. The result was a ground-breaking system that for the first time made it possible for viewers to experience live race drama from an on-track point-of-view, which had never been done in any kind of professional cycling event. Television and Internet viewers, including those watching a giant screen within the velodrome, were afforded dramatic views that rivalled those experienced by the competitors. In live race conditions VeloVue HD proved to be a revelation. The HD images were transmitted over RF links to a production truck just outside the velodrome where HBS provided coverage for broadcasters in more than 100 countries and territories worldwide, many of whom commented positively on the insights provided by new vantage point. Sport has always been a prime driver for innovation and we're discovering on an almost monthly basis what can be done with technology this small, robust and reliable. Achieving reliable quality in such a small form factor has been the stumbling block for many, and without technologies such as Cobham's Nano HD, would have been impossible just a few years ago. But in coupling Videosys's engineering, manufacturing expertise and onsite experience, Broadcast RF's vision and design, and Cobham's wireless technology, we're way ahead of the field.